“There’s nothing to do! I’m bored!” is the battle-cry of children everywhere who are on summer vacation. Yet after weeks of counting the days for school to end, children are at a loss for what to do with their newly found freedom. During the years that children are developing, there is a process called individuation that is meant to unfold when their interests, likes, ideas, opinions, priorities, abilities, goals, and aspirations increasingly emerge. They eventually discover who they are and what they believe. They are slowly moving in the direction of becoming their own persons. By the time a child reaches adolescence, his own interests and meaningful activities have potentially taken shape. We hope that our education system contributes to realizing the fruits of this process. But by now we all know that we need to re-create our educational system so that it can truly support our children’s developmental needs. It is sad to see that while our kindergarten children are filled with curiosity and enthusiasm to learn, this thirst for learning diminishes as they reach higher grade levels: they become easily bored. The problem is that in today’s world this boredom is camouflaged with many sources of outer stimulation – friends, video games, television, cell phone texting, the internet, shopping malls, and so on. These entertainment factories further extinguish our children’s creativity; they are taking so much in, that there is little time or space for anything to spring forth from them. Summer vacation, a time when pressure from school is reduced, is a time for parents to prime and support the individuation and emergent process and reawaken their children’s natural drive to learn and explore. Perhaps this can give summer vacation a more meaningful context: an opportunity to fulfill an important role in your child’s development. This is a worthy goal, but not an easy one to support. The first key for supporting healthy development is in helping the child’s brain come to rest. When the demands of school pressure a child to perform and behave in certain ways, all of his energy is diverted away from creative endeavor to securing his attachments. He must perform and measure up to the standards of the adults that are in charge of him in order to maintain his sense of connection with them. Preserving this feeling of connection and closeness is a child’s most critical need – to feel warmth and safety, to belong, to matter, to find favor, and to find approval in the eyes of those he cares about. Children are in constant pursuit of feeling safely attached when they are feeling judged, compared, and graded, as they are in school. Worse yet, is when our children begin to care more about pleasing their peers than the adults in their lives – this leads to an insatiable urge to pursue more and more attachment with each other in a futile quest to have their need for closeness met. Children need to be brought to rest from this work so that they can grow, and it is our responsibility to provide that rest, not theirs to somehow manufacture it for themselves. If the child’s brain cannot come to rest, the child becomes less and less interested in learning as the years go by, they can lose their sense of caring, and become more easily bored. Summer vacation is an opportunity to give your child rest by creating and deepening his attachment to you. He needs to continually experience the feeling that you are holding on to him, taking care of him, taking responsibility for your relationship with him. When your child knows how much he matters to you, he can let go — his mind is free to create, explore, discover new interests, and express his unique self. The second key for supporting healthy development is giving the child room to express his own thoughts, ideas, tastes, opinions, and feelings. Parents can ensure unstructured time and supply the ingredients that encourage children to explore their inner world. 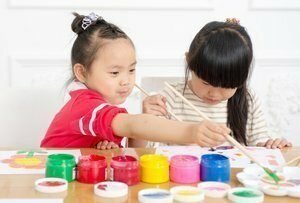 Arts and crafts supplies, fabric for assembling costumes for dress-up, musical instruments, building or writing materials, and other equipment for free play and expression give children opportunities to grow into themselves. One mother told me that her children went to great efforts to drag an empty refrigerator box four flights up to their apartment. She was amazed by her children’s creativity in turning this box into a magical place! The box first became a house, then a bus, then a classroom, and then many other things. While your child is exploring his inner world, you will have the opportunity to get to know him better, too, and further deepen your attachment with him. Here are some questions parents can ask themselves in order to generate some intuitive answers and insights. How can I fill my child’s primary need for a deep and secure attachment to me? How can I provide quiet space and time for my child? How can I learn more about what my child is interested in? What materials and tools can I provide to encourage my child’s self expression? How can I shield my child’s budding individuality from outside pressure? There are as many answers to these questions as there are parents and children. Being the answer for your child is a way to turn summer vacation into an enriching experience for yourself and for your child.